Roadmap Basics: What Is a Roadmap? It also serves as a communication tool, a high-level document that helps articulate the strategic thinking — the why — behind both goal and the plan for getting there. 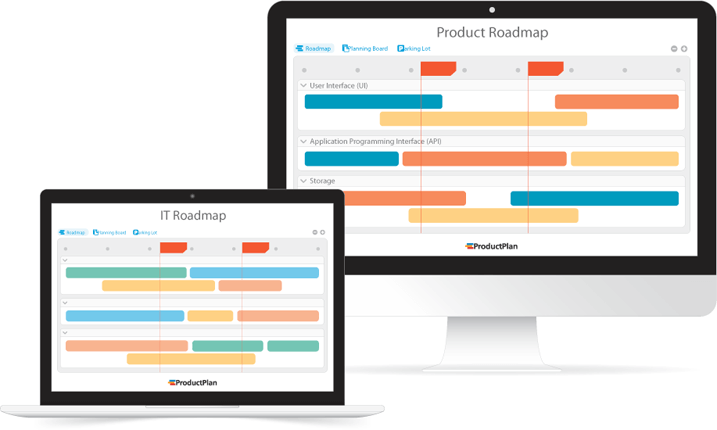 Although we at ProductPlan generally discuss the roadmap as a strategic tool for guiding the development of products, it can be used for all types of strategic initiatives. Indeed, businesses all over the world use our web-based roadmap software to create their organizations’ marketing plan, IT strategy, and others. When it comes to understanding the role of the roadmap, perhaps the most important concept to remember is that it is a strategic document, not a document that captures all of a plan’s details. With this in mind, it is also worth reviewing what it is not. This is another very specific type of document. A backlog is essentially a to-do list of the tasks required to complete a strategic initiative, ideally arranged according to priority. Roadmap planning is often the process of creating a high-level strategy out of a collection of backlog tasks and ideas. A roadmap, therefore, can and should work together with a backlog in the sense that the person responsible for the roadmap (typically a product manager in the case of a product roadmap) will translate its high-level strategic components into tasks that can be assigned and tracked throughout the project. It’s not a project management tracker. Many managers confuse roadmaps with the documents or software applications used to compile all of the details to complete the initiative — the individual assignments, the personnel responsible for each task, meetings scheduled to discuss specific issues or milestones, deadlines for completing each element of the project, etc. These details should be tracked and updated throughout any strategic undertaking. But the tool for this will be a project management tracker, such as Trello, PivotalTracker or JIRA. It’s not a list of features. Finally, many product managers mistakenly assume their planned list of features or epics constitutes the roadmap itself. But this is not the case. 1. A high-level plan, defining an overarching strategic objective and capturing the major steps planned for achieving that objective. A list of features alone will not capture or articulate the strategic thinking behind building a product in a specific way. Creating a valid product roadmap requires telling a cohesive story — showing how all of the themes, epics, and individual features will come together and result in a product that meets specific company goals. 2. A communication tool that helps communicate the product’s strategy. What does a list of features communicate? Beyond the items on the list, not much. This is why a strong product roadmap requires a clear and concise strategic rationale for including any feature or epic. If a product manager cannot persuasively make a case for including a feature, she should not include it at all. One reason so many entrepreneurs, product owners and other professionals responsible for driving large strategic projects mistake the roadmap for something else is that they have historically not had the proper tools. As a result, they have defaulted to treating other forms of documentation fundamental to the process — a backlog, a project-management tracker, or a list of the features — as the roadmap itself. But as we have discussed here, these documents often fail to capture the key element: strategy. For this reason, we recommend that for any strategic undertaking — whether overseeing the development of a product or updating your organization’s IT infrastructure — you use a purpose-built roadmap tool. The best of these tools are web-based and dynamic, and they can be created, updated and shared in minutes. Perhaps the most valuable benefit of a dedicated tool is that its clean, visual display will allow you to clearly document and share your strategic reasoning.